We would like to thank you for visiting with us and giving us the opportunity to tell you why other families have used our services. We feel quite confident that our program can substantially reduce anxieties often faced while trying to make informed decisions about admissions and financial aid. The College Resource Center provides the assistance you need to become a successful college applicant. The college admission process is so competitive these days that every applicant needs a carefully organized strategy. It doesn’t matter if you’re an average student who fears being turned down for admissions, or the campus star that expects an open door everywhere; if you hope to get into the college of your choice, you must come up with successful personal game plan—and that’s what The College Resource Center is all about. 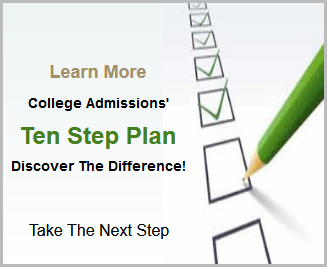 The College Resource Center’s strategy for helping you gain admissions to the college of your choice is called the “Ten-Step Plan To College Admissions”. These logical sequences of steps have been followed for over twenty-four (24) years at T.C.R.C. Its practicality is demonstrated by the fact that most students who have followed it have gained admission to good colleges, as well as less selective colleges when appropriate to the student. While many students feel they can enter these colleges their own way, we feel our plan has the advantage of reducing the anguish and anxiety that is inevitable in the admissions and financial aid process. More importantly, it works! Thanks again for viewing our site. We look forward to having the opportunity to be of service to you.